In the southeast corner of the San Juan circle, Lopez Pass is the first opportunity available to boaters transiting Deception Pass to exit Rosario Strait. Vessels crossing the Strait of Juan de Fuca and electing not to use Cattle Pass may likewise choose Lopez Pass as an alternative to continuing north of Rosario Strait. If conditions in Rosario are conducive to comfortable cruising, many boaters will bypass Lopez Pass and continue north to Thatcher Pass to gain the interior of the archipelago. Entering Lopez Pass from Rosario Strait requires a vessel to initially follow a southwest course. Prudent mariners will round the southwest corner of Ram Island before turning to the north. 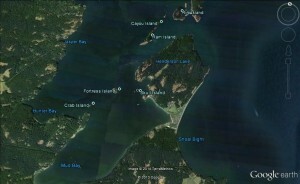 Lopez Pass affords direct access to two popular Lopez Island anchorages, Mud Bay and Hunter Bay. On busy summer weekends, Thatcher Pass can be very congested. Lopez Pass offers a more laid-back alternative with substantially less vessel traffic. There are notable currents in Lopez Pass, but typically nothing of major concern when navigating. Average current speed at maximum flood is 1.6 knots, and 1.3 knots at maximum ebb. During extreme tide changes, currents will run faster than average. The current turns to flood 1 hour and 13 minutes earlier than flood in Rosario Strait and reaches maximum flood 1 hour and 33 minutes sooner. The current turns to ebb 39 minutes earlier than predicted for Rosario Strait, with maximum ebb occurring 1 hour and 16 minutes earlier than in Rosario. The flood current is 1.2 times the predicted velocity in Rosario Strait, while ebb current is only 0.6, or just over half the speed of currents in Rosario.